Sphalerite (light grey, top) is inclusion-free and is intergrown with coarse-grained quartz (dark grey) showing faint internal reflections (centre left). 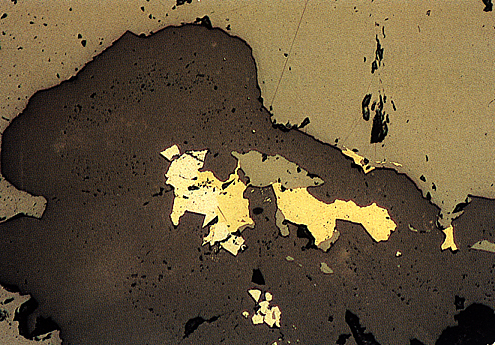 Sphalerite (centre) is intergrown with chalcopyrite (yellow, centre right) and euhedral gersdorffite (white, high reflectance, centre left). Black areas are polishing pits.